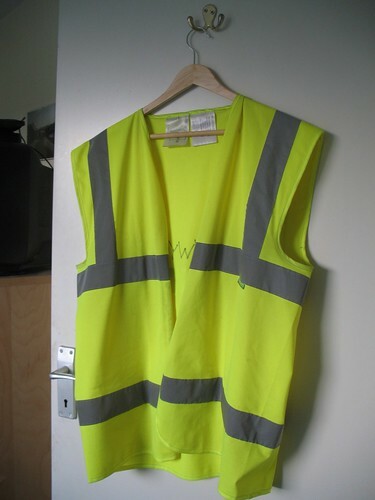 i try not to bring work home with me, but apparently i was in such a rush to leave the office on friday afternoon that i forgot to take off my neon yellow safety vest before clocking out. it happens to everyone at some point or another. at least i came straight home with my vest underneath my raincoat, revealing my forgetful indiscretion to exactly no one (until now). the boss' wife once famously wore her vest over to a friend's house, and spent several hours sipping tea and chatting before she noticed that she still had hers on. when she asked her friend why she hadn't said anything, the friend replied that she thought it was part of her outfit. ouch! anyhow, i suppose i really needed the break this weekend. i have been quite busy at work the past few weeks. i attempted to fix the wasabi jumper last weekend but ultimately knitted a few rows, realized i had made another mistake, ripped back, tried again, made the same mistake again, and ripped it back again. i will try again later when my head is a bit clearer. for now, i'm enjoying the sun streaming through the windows and music playing on s's ipod. ah, domestic life...! have a good weekend. i'll post again soon. why the heck do you need to wear a yellow safety vest at work? are there fork lifts driving through the office? or is this one of those things like the little kids in horigane who wore hard hats to school in case a volcano erupted on the two minute walk?